This diagram depicts the appearance of a fibrinous pericarditis. 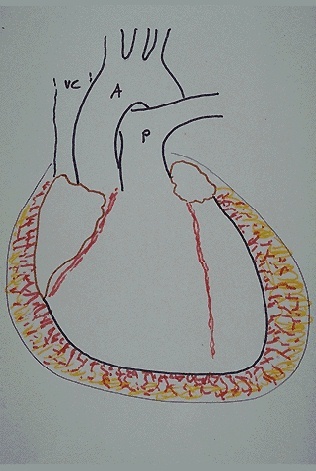 The red-pink squiggly lines extending from the epicardial surface into the yellow fluid represent the strands of fibrin. This type of pericarditis is typical of uremia with renal failure, underlying myocardial infarction, and acute rheumatic carditis.